Perhaps unsurprisingly, every seat in the Tate’s Starr Cinema was taken on 16 July 2018, where Jenny Holzer was in conversation with Tate director Frances Morris. With the rise of right-wing populism, fake news, and the West’s growing estrangement from ‘truth’ and objective fact, I sat alongside hundreds of others in silence, ready to embrace whatever insight Jenny Holzer could offer. After all, Holzer was the one who told us back in the 80s that ‘ABUSE OF POWER COMES AS NO SURPRISE’. In dire times we, as always, turn to art and artists for answers. Holzer is a conceptual artist renowned for her politically-engaged, language-based installations. A self-defined ‘outdoorsy’ (read: street) artist, Holzer first made a name for herself in the late 70s with Truisms; posters laden with aphorisms which were pasted in public view on the streets of New York. Each Truism poster contained various clichés, slogans and mantras, so that each poster became a collection of diverse viewpoints. For instance, one page from Truisms (Toronto), made in 1982, suggests that ‘POLITICS IS USED FOR PERSONAL GAIN’, that ‘PRIVATE PROPERTY CREATED CRIME’, and ‘THERE ARE TOO FEW IMMUTABLE TRUTHS TODAY’. Meanwhile, a different page from the series read ‘A STRONG SENSE OF DUTY IMPRISONS YOU’ while simultaneously suggesting ‘FREEDOM IS A LUXURY NOT A NECESSITY’. Ultimately, nothing added up. 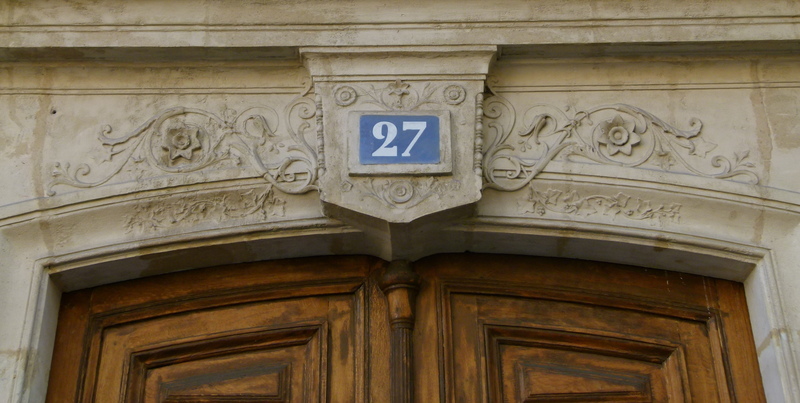 There was no right or wrong statement, no completely correct assertion or utterly wrong declaration – even the artist herself didn’t necessarily stand behind all of the lines on the page. But Holzer’s intention was to let the viewer’s subjective interpretation generate an emotional or intellectual response to the provoking statements. 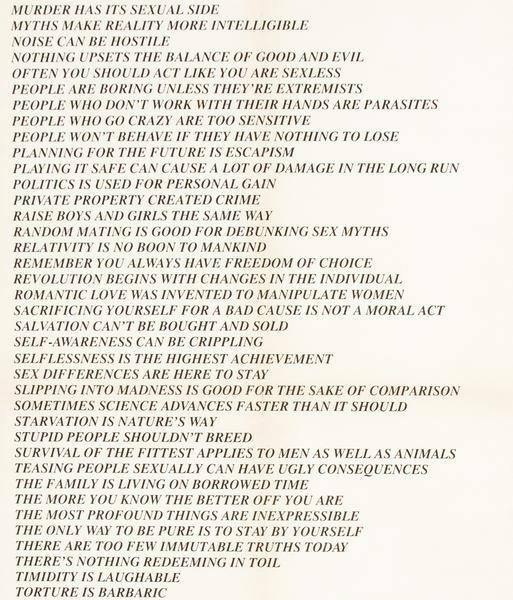 In response to Morris asking why Holzer’s Truisms of the late 70s and early 80s tied together so many standpoints, Holzer said; ‘It was more accurate to offer a wealth of opinion’. The talk led the audience through Holzer’s entire body of work, including major undertakings such as her projection installations, which were shown in various cities across the globe including London, Rio de Janeiro, Singapore, Melbourne, and her native New York. Much of the text used for the projections came from Truisms and Inflammatory Essays, but, at times, Holzer also adopted words used by other people, including protestors, poets, and presidents. ‘ABUSE OF POWER COMES AS NO SURPRISE’ (Truisms, Holzer) was projected in New York’s Times Square in 1982; ‘I WANT PEACE WITH ALL MY BODY AND SOUL’ (Wildpeace, Yehuda Amichai) in London’s St Giles Cripplegate Church in 2006, and ‘THERE IS BLOOD AND MORE BLOOD’ (Arno, Holzer) shone on the Parisian Louvre Pyramid in 2009. Although the site-specific locations (in addition to galleries and exhibitions) in which Holzer has displayed her art are indeed remarkable, it’s really how Holzer forces certain issues into the public consciousness which deserve the most praise. From her 2016 granite installation in New York’s West Village – which features excerpts from Walt Whitman’s Song of Myself, celebrating the memory of those who died in the AIDS epidemic – to her 2006 Redaction Paintings series – which made use of official declassified US military documents in an attempt to make sense of the ‘war on terror’; a sensationalised excuse used to support the invasion of Iraq – Holzer’s work has always been concerned with both societal and global matters, and in turn, has prompted the audience to question the status-quo. The conversation moved on from older work to more recent projects, and the overhead projector settled on photographs of Anti-Gun Truck, which is arguably Holzer’s most affecting work to date. Made in 2018, Anti-Gun Truck is an installation series in which a truck bearing poignant slogans on its side pulls up by specific locations: Trump Tower, the White House, a cemetery. Tallahassee #2, for me, was particularly disheartening. 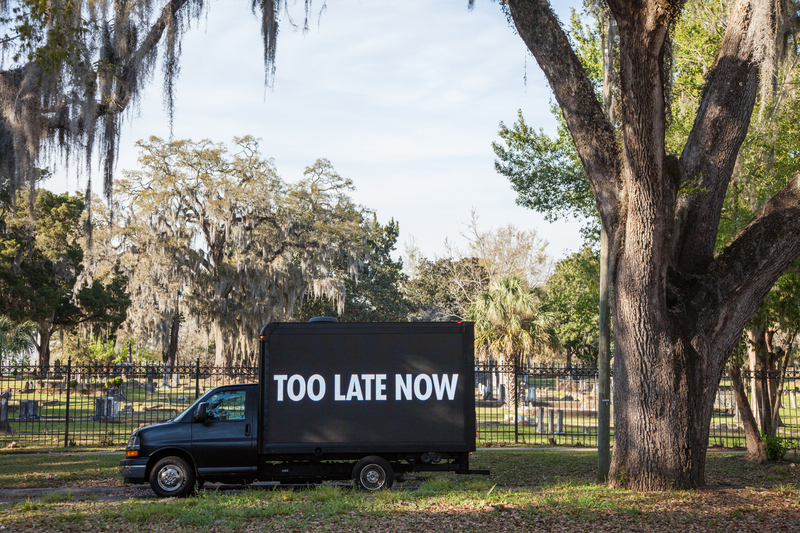 The dismally dark truck – which was like an automotive Grim Reaper, and brandished the words ‘TOO LATE NOW’ in white – was positioned in front of a Florida graveyard. The graveyard in question, however, wasn’t an ordinary graveyard: it was one of the burial places for students killed in the 2018 Marjory Stoneman Douglas High School massacre. This year marks three decades since the first Truism was shown, and politically-engaged artists can no longer run the risk of offering a ‘wealth of opinion’ in their artworks. Due to the acceptability of xenophobia, homophobia, transphobia, racism, misogyny, classism, and the violent tendencies in the West’s political leaders – the ones who govern from the White House to Westminster – we now exist in a culture which demands direct, challenging art to be made. Contemporary art must confront, must oppose, must defy – as now is not the time for interpretation, but for interrogation. As one of the most renowned living artists, Holzer recognises this urgency. Now, her work is more insistent than ever.